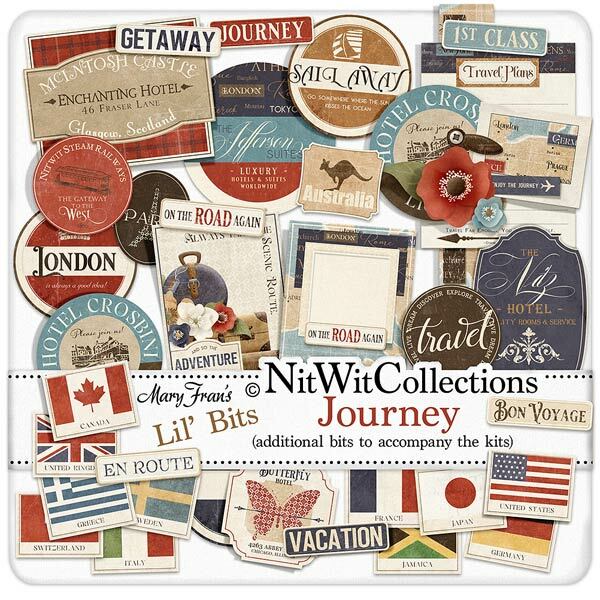 Lil' Bits "Journey" offers you a spectacular array of intricately designed vintage labels, flags, and word phrase tags to get you quickly creating your scrapbook layouts, mini albums, cards and travel planner. You must be exhausted from your trip, so let's make it a little easier on you by simply placing these digital elements into your creations for quick and brilliant results! Don't miss out on these digital elements as they are not included in the FQB "Journey" Collection so please don't miss out on owning and creating with these elements! 1 Circle label - "Dream...Discover...Explore..." 5 Vintage hotel labels that take you back to a time of leather suitcases handled by a bell hop, and tea on the sunny balcony....so civilized! Which one fits perfectly into your creative vision?? 1 Journal card adorned with the suitcases - "Always take the Scenic Route"
1 Vintage label - "Australia"
1 Vintage label - "London"
7 Vintage looking word phrase tags with classic sentiments...which also fit perfectly into the blank areas of the tabs found in the FQB - Journey Collection. Design and function all rolled into one!